Paper Size: 26.75" x 20.25"
Around the world in style . . . 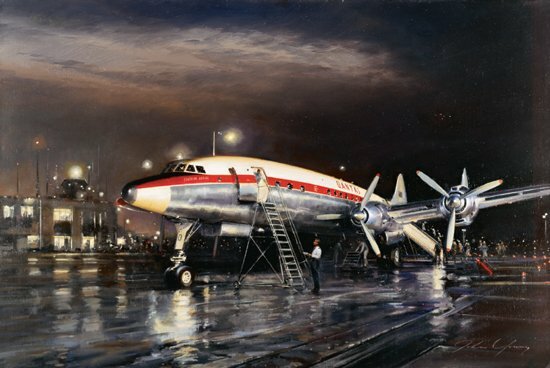 In 1958 Australia's national airline, QANTAS, inaugurated an around the world service using their new Lockheed 1049G Super Constellations. The Super Connies were the queens of international airline fleets, a position they enjoyed until the introduction of the early jets. The rain wetted ramp might be Hong Kong or Idlewild, Karachi or Le Bourget and one is left with the smell of rain in the evening air.